Which time is best to plant? The best time to plant vegetable gardens is dependent upon where you live. The hardiness zone determines whether you can plant directly into the soil or if you'll have to start your vegetable plants indoors. If you don't already know what your hardiness zone is, the best way to find out is to use a hardiness zone calculator (available here on the LoveToKnow Garden website). Once you know what your hardiness zone is, you can begin planning on when to put those seeds directly into the ground or when to start your seedlings indoors. Cool crops are those that can be planted earliest in the spring. These include vegetables such as broccoli, cauliflower, cabbage, onions and Brussels sprouts. Some lettuce plants also fall into this category. These types of plants can tolerate a late frost better than other less vigorous plants with tender leaves. As soon as the ground can be tilled, these crops can be planted. Depending upon the hardiness zone, this could be anywhere from early to late April. Warm crops are those that will not survive a late frost without protection. These plants include peppers, tomatoes, eggplant and some lettuce varieties. If you suspect a late frost, and these plants are already in the ground, cover them overnight and then promptly remove the covers once the sun is out in the morning. Tender crops may be planted early, but they require hot caps to help them grow and avoid frost damage. Crops that fall into this category include cucumbers, melons and squash. Hot caps are essentially mini hot houses used to cover the plant while it is germinating and sprouting. These can be purchased commercially, or they may be made from common household items, like gallon jugs. (Simply cut off the bottom of the jug and push the container into the ground about an inch deep around where the seeds are planted. Once the plant is growing well above ground, remove the jugs). If you live in a cool climate and need to start your plants indoors, start them about a month before you will be able to plant them. These seedlings can be planted in many different types of containers, depending on what is available. Some gardeners prefer peat pots, while others insist on using fortified potting soil. The plants can be started in pots or simple paper cups. What is important to remember is to keep the plants warm and moist while they are germinating and growing. Seedlings may benefit from heat mats placed beneath the pots, but caution must be used to ensure that the mats aren't too hot. Having a grate placed between the heating mat and the pots may help prevent the soil from drying out too quickly before they are watered again. 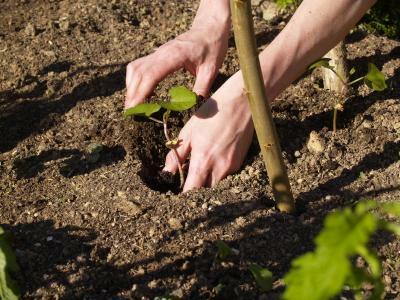 As soon as the weather allows, the plants should be transplanted outdoors into prepared soil. When purchasing seeds from a retail store, the back of each seed packet provides valuable information for the gardener. The back of the seed packet identifies the best time to plant a vegetable garden in your area. If you live in an area that is between two zones, choose the cooler zone to make the determination on when to plant the seeds. While no one can predict the weather for certain each year, hardiness zones will certainly help in determining the best time to plant vegetable gardens. Following local weather reports can also help gardeners avoid disaster by notifying them of frost alerts. Covering these plants overnight will save plants from frost damage. Finally, use seed packet information to help determine when is the right time to plant a particular vegetable. If you can't plant the seeds early outdoors, start them indoors for a bountiful crop each year.